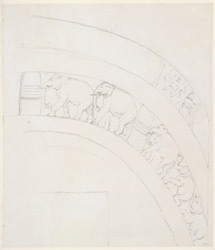 Pencil drawing by Thomas Daniell of part of the elephant frieze over the doorway of the Lomas Rishi Cave in the Barabar Hill, dated 1790. The Barabar Hills are home to a group of cave temples which date to the Maurya period or the third century BC. They represent some of the earliest examples of rock-cut architecture in India and were used by Jain monks as a retreat. This drawing depicts part of the entrance to the Lomas Rishi cave which has a very elaborate doorway imitating the elevation of a hut with sloping timber supports, curved eaves and a pot finial. Above the doorway there is a rounded arch and two separate carved bands reproduced in this drawing. The upper band is carved in imitation of wooden latticework. Below is a sculpted frieze of elephants proceeding towards stupas. The interior of the cave consists of an oval chamber with a dome roof entered through a rectangular vaulted hall.